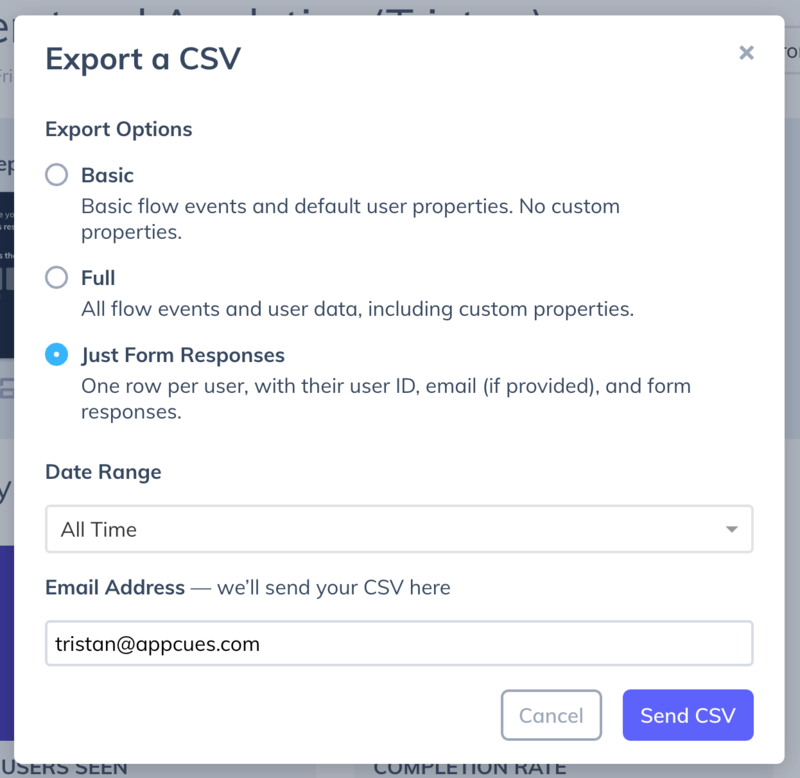 The easiest way to see all form responses for a user is to choose "Just form responses" in the Export dialog. The export will be emailed to you in a few minutes, and will include one line per user, with their latest response per field and the date and time it was last submitted, in a condensed format that's easy to read. If you need more detail or granularity, continue on to the next section. Individual form response events are included one by one in the Full and Basic CSV exports as well, but they require a lot of manual work to determine which responses came from which users. You need to correlate specific user properties with each response at the time it was submitted. You need to see all responses, not just the latest. You want to calculate the timing of when each form element was filled out, not just see the most recent time. You have other advanced needs that require viewing each form event separately. If you don't need to do these kinds of advanced analyses, you should export "Just form responses" as shown above. 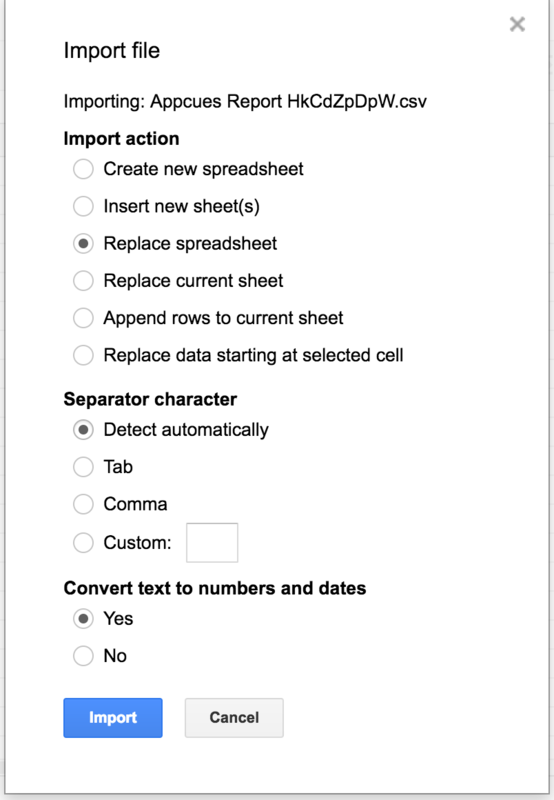 Once you received and download your CSV via email, the easiest way to view the form response data is to import the CSV into Google Sheets or Excel. 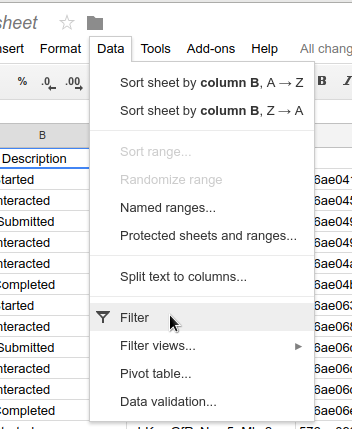 The example below uses Google Sheets. The file will come in the email in a .gz format, so you may need to convert this to .csv before uploading to your product of choice. On a Mac you'll simply click the file, which will open it and automatically convert it to a .csv format. On Windows, you may need to use a conversion software like WinZip or 7-Zip. Open your new sheet and in the 'File' tab, select 'Import'. You will then see a few options. 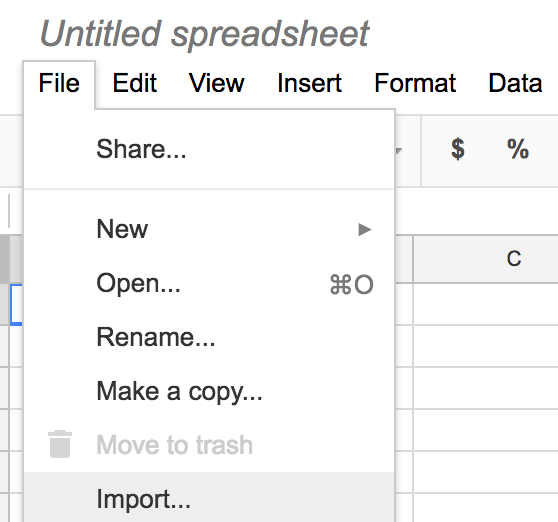 You can choose whichever options make the most sense for you but, for a new Google sheet, the default options will work just fine. 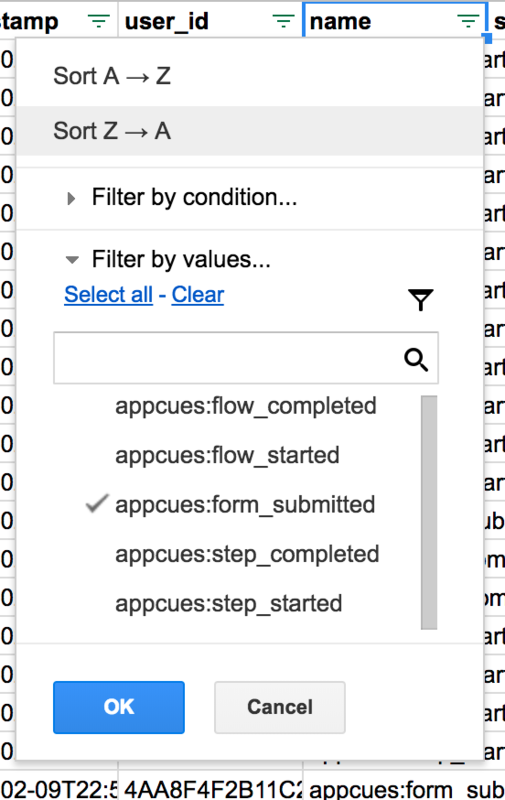 Now you can filter the name column to "appcues:form_submitted" to retrieve the results. For each of the fields in the form, there will be a column titled "attributes.interaction.response" followed by the question or label associated with that form field. In that column you'll find the user's answer to the question. One of the columns in the spreadsheet will be titled attributes._identity.userId, which will indicate which user submitted this response.